If you google Jon Boat you’ll find a good amount of information on these boats, building plans, stories and information. Looking through it all I began to notice references to Ozarks Jon Boats and many different articles with authors claims as to where it originated. Stating they came from Arkansas to Pennsylvania but in almost every instance the word “Ozarks” is used. I imagine the name Ozarks Jon Boat is named Ozarks Jon Boat for a reason and it would have to be because it was originated right here in the Ozarks. At least that’s what I am going with because I want to believe that to be true. Whether it is or it isn’t really doesn’t matter the White and James Rivers were the hot bed and that’s a fact. 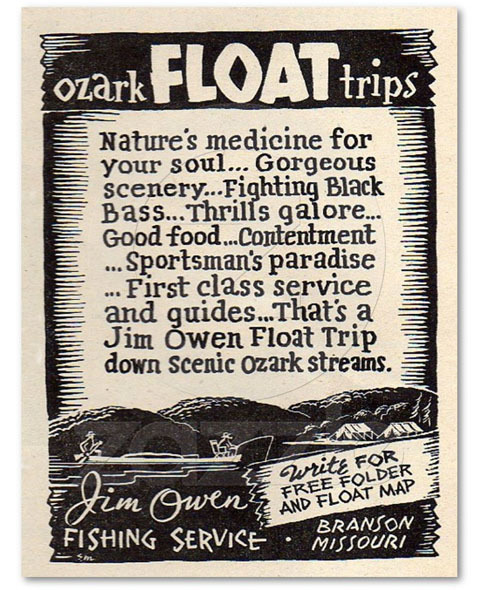 No one was more responsible for popularizing the Jon Boat and float fishing than the Jefferson City newspaper advertising manager Jim Owen who visited the Ozarks in 1933 and built a thriving guide business from the mid 1930’s through the fifties. Owens publicized his business all over the nation and attracted wealthy business men and famous folks. He brought in reporters from Life, Look, Outdoor Life and Sports Afield who wrote articles about their adventures and spread the fishing gospel to the masses. Owens was smart enough to hire local colorful guides to shuttle those people down the White River on eight day floats. The floats were quite the elaborate set up including expensive equipment and provisions and of course the famous, custom made “Ozarks Jon Boats”. The guided trips generally had what is known as a commissary boat that would accompany the trip and float ahead of the fishermen to the next camp site and set up tents and prepared for the evening meal. Owens guides had $2.00 a day rates when they started around 1935 with a fleet of six boats and a truck to haul them. At it’s peak Owens had 40 boats and 35 guides which made a whopping $10 a day. 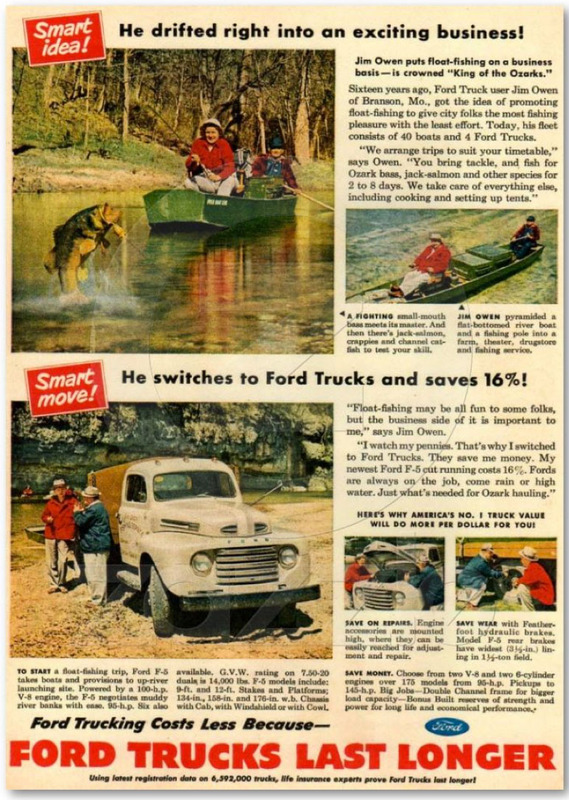 His last float trip was in 1958. A Cotter, AR, trout dock bought his equipment soon afterward. Owen suffered a stroke in 1966 and died in 1972. For the day the boats were something special, they were built wide enough to allow folding chairs to be used to increase the customers comfort rather that sitting on the standard old wooden plank we are all too familiar with. The business and the boat builders thrived through the fifties until the Army Corp of Engineers dammed up the White River and sealed the fate of the industry. Looking back now it’s easy to see what happened to the Jon Boats popularity after Table Rock Dam was built, it simply all but disappeared with the exception of a few die hard builders on the Big Piney and the Current Rivers. No disrespect to those builders and guides but we all know the party was over. 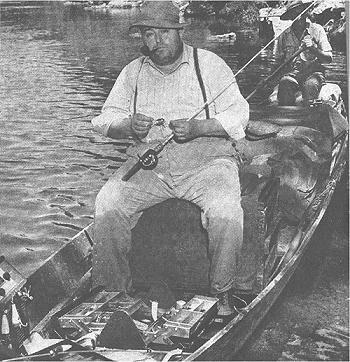 Jim Owen made the Jon Boat, James River, White River and float fishing business famous from coast to coast, make no mistake about it. Towns like Galena never really recovered their tourism business when he shut the doors. The romance of the river as it was is gone as the crowd made it’s move to the new large impoundments and for as much as the music industry made Branson the lake didn’t hurt. If you are interested in building your own Ozarks Jon Boat here are some resources. Would you like to take a guided trip in an authentic Ozarks Jon Boat? Contact Kyle, he can make it happen, make sure to request a Hootentown launch! We’re in the designated trophy smallmouth section of the river. LongBoat Outfitters or drop Kyle a note. You also might be interested in this interview about Kyle and Longboat Outfitters. Thanks to Kyle for the entertainment! This was very interesting and I like the picture of the old poster or magazine ad titled, ozark FLOAT trips. The black and white was a poster that was produced in the 40’s & 50’s, The magazine ad was in Sports Afield, most people don’t know Jim Owen owned a car dealership, a restaurant and a tackle store as well as running the boat service. Busy guy. Great Blog on some of the history of the rivers and boats of the Ozarks. Michalak are the plans I bought to build my first and second jonboat “longboat”. If anyone has any questions on building let me know. Also the Godsey plans are are the same as Michalak with less detail. Thanks for the information Kyle. If you have anything to add or would like to share any of your adventures I can always use a guest writer to fill in the blanks. I am looking for a set of plans for a white river type jon float boat, this boat has a similar rake in the front & back, I have ace’s to cypress material & I have several of my own ideas to incorporate in this build. I fish the mid Mere mac river in east central mo.